Several years ago someone came up with the idea of having a worldwide ‘Voice’ day to focus on the importance of oral communication and understanding our voice and how we use it. I’m sure most of you were not aware of it but this year it takes place on 16 April. Previously I have been involved in poetry readings and Shakespeare recitals on that day but this year I won’t be doing anything special. I will, however, be focusing on how vital our voice is in practically everything we do and how much we take it for granted. During the last month I’ve been working with several new clients who have English as a second language and they all have individual issues but collectively they want to be better understood and they want to make communication in English easy for everyone they meet. As native English speakers, we sometimes take our language for granted and we abuse it by being lazy or don’t make sufficient effort to keep control and speak words accurately. On 16 April why not spare a moment to think about your speech and how you could make it even better. March had a busy first half for me with adjudicating in Harrogate and Bath, examining in Nottingham and Solihull and a large number of private clients. I’m having a break for Easter and planning for a six-week adjudicating tour in Sri Lanka coming up n May. Currently, new private clients are going in the diary for July! Where is this year going? Well the unthinkable has happened – a French silent film has won best picture at the Oscars! You might think that as a voice coach I would be a bit peeved, but far from it, I’m delighted! I have always been fascinated by mime and when I was studying at the Guildhall School of Music & Drama (many years ago….) I really enjoyed the mime sessions. You may wonder why actors study mime? Well, an actor needs to be able to show every emotion on the face and in the body as well as in speech and they therefore study mime to quite a high level. I remember as a child being fascinated by a mime artist called Marcel Marceau who was frequently shown on TV doing his famous ‘Bip’ character sketches. He was French too so there is obviously something in the water over there. 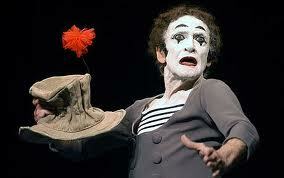 Nowadays we don’t see mime so much in mainstream entertainment but it’s still there on the fringes if you look for it. I suppose the Cirque du Soleil employ it most successfully in their shows which have no words and therefore no barriers of country, language or religion. 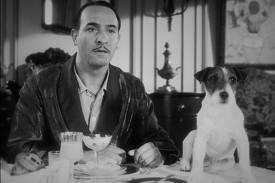 Have I seen ‘The Artist’ yet, you ask? NO! – the diary has not been helpful but with a bit of luck I’ll make it this weekend and I can’t wait! February has been very busy with two open and six bespoke voice workshops for BT, National Grid, Notts & Manchester Councils. I also spoke for the Coventry Chamber of Commerce and the Institute of Internal Communication plus two networking breakfasts. There won’t be any open workshops now until the autumn as I’ve got some traveling coming up but you’ll find all the details on my website here. So get to see ‘The Artist’ if you can and see for yourself the power of mime. 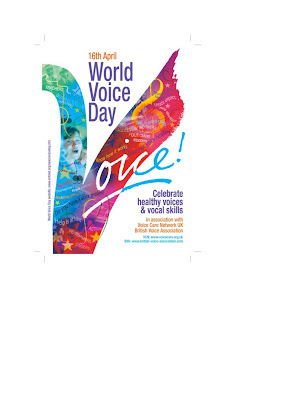 Mind you, use your voices too – it would be a strange world without them!